If speed for price was the only criteria for judgement, HP Laserjet 1505n will probably win as an entry level laser printer from the HP stable. However other than price, other aspects can at best be called meeting the expectations. The print quality from this printer is just average as the prints come out grainy and with slightly washed out edges. While it does have a print resolution of 600x600 dpi, the final results fare less on quality than other printers with similar resolution. It does have a good speed, with the first print coming out in 6.5 seconds, and 24 ppm being the overall print speed. The HP Laserjet 1505n Toner Cartridges last about 1500 pages and the average duty cycle is 8000 pages per month. It is a compact and lightweight printer with a input tray that can hold 260 pages and is covered to help keep the sheets clean. HP Laserjet 1505n comes with a USB connectivity and an optional HP Jetdirect Ethernet print server. It has an inbuilt memory of 2 mb, which can also be upgraded. The simple interface and adequate memory help this printer in being after than others in similar price range. The best part about this printer are the print speed and low price, which combine to make it a highly cost effective printer. The high speed and low price along with the cost-effective printouts using compatible HP Laserjet 1505n toner cartridges, make it good for non-critical print operations. If your main requirement is of high-quality prints then it would be better to explore other options. How can I get rid of the printing issues of my HP Laserjet 1505n printer? The problems like light, faded, smeared prints or vertical defects on the printed document are so common to have if the toner cartridges are too old or dried out. One need to replace the cartridges with the good quality HP Laserjet 1505n toner cartridges in order to improve the quality. The information below helps in identifying and correcting such print defects. NOTE: If these steps do not correct the problem, consult an HP-authorized dealer or service representative. Q. I need to seal my HP Laserjet 1505n toner cartridges as I won’t be using my printer for a couple of months. One of my friends told me that I should wrap them in a moist cloth. Is that true? A. Yes, it’s a good thought of doing that as you won’t be using them and keeping them open will affect the quality of your toner cartridges. Cartridges that won’t be in use for a while have to be sealed and stored properly so that ink doesn’t dry out and they remain usable for long. Take a slightly dampened cloth, wrap it around the cartridge (use separate towels for each cartridge) and keep them in airtight container. Q. I’ve installed HP Laserjet 1505n toner cartridges in my printer. Even after installing the cartridges, ‘cartridge is empty’ message displays. Why? Also, suggest me how can I resolve this problem? This error message is usually because the cartridge is not firmly fitted in its slot. Sometimes the printer software estimates the amount of ink remaining in the cartridge by remembering the print volume when the previous cartridge was installed. Thus, when a new cartridge is installed before the printer driver resets, the printer may think that the old empty cartridge is still in use. Check whether the new ink cartridge you have installed in the printer is unexpired or isn’t dry. To resolve this problem, reinstall the cartridge and click on the install new cartridge option. In case of expired or dry ink cartridges, you can buy compatible HP Laserjet 1505n toner cartridges from Printerinkcartridges.ie. A. The print speed of this printer is 6.5 seconds for the first print and 24 pages per minute is the overall print speed. Q. Where can I find out the list of media supported by HP Laserjet 1505n? What will happen if I use paper that does not meet the recommended HP standard? A. You can find out the HP Laserjet 1505n compatible media from the user guide or the HP LaserJet printer family media guide. If you use a media that does not qualify the specified guidelines by HP it may cause frequent paper jams, very poor print quality or a premature wear and tear of the device that may lead to an expensive repair. To avoid such problems make sure to verify the media from the user’s guide or carry out a test printing with the machine. Q. Will I get an extended discount, If I purchase compatible HP Laserjet 1505n toner cartridges in bulk? A. Yes. A multipack of toner cartridges on our website is far cheaper than purchasing a single pack of cartridge. For instance, the single pack of HP Laserjet 1505n CB436A (36A) compatible toner cartridges will cost you €20.5 whereas the 2 pack of the same toner cartridge will cost you only €36. Q. Does HP Laserjet Pro MFP M225DN print A3 size sheets? A. Sorry. 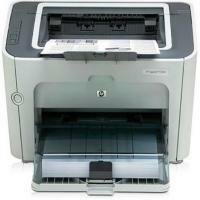 The HP Laserjet Pro MFP M225DN prints A4 size sheets and does not support printing for A3 size sheets. Q. What is the delivery charge for a pack of HP Laserjet 1505n toner cartridges? I live in Galway and I need to know whether the delivery charges are same for every location or not. A. The delivery charge for each of our products starts from €1.99 including VAT. Going further, the delivery of an order is charged based on the weight of the product. Our delivery charges do not fluctuate with locations. The charges would remain the same whether a pack of cartridges needs to be delivered to Galway or Dublin. Hope this clarifies your question. Q. I have a Laserjet printer model P1505n. Will these listed HP CB436A (36A) toner cartridges for HP Laserjet 1505n work fine with my P1505n model? Q. My printer is HP Laserjet 1505n model. The listed cartridges for this model have letter "A" appended to the product code. What is the difference between CB436A and 36A and will these fit perfectly to my printer? A. Yes, both these HP Laserjet 1505n toner cartridge work perfectly fine with your HP 1505n printer. The HP 36A toner cartridge is same as CB436A toner. Both of these are the name for same product. It is a high quality toner cartridge which can yield 2000 pages at better value of money. The HP CB436A (36A) is also available in a compatible version which offers same standards for printing and has capacity of yielding 2000 pages in a lifetime. However, being similar quality toners compatible versions are available at almost 70% lower cost. Q. My printer is a HP Laserjet M1522nf model and I am looking for replacement cartridges. Will these be compatible? Q. Hi, I have a HP LaserJet p1005 MFP printer model. Will these cartridges be compatible? Q. Are these cartridges suitable for a Xerox Phaser 3320 printer? A. No, these are compatible HP CB436A (36A) toner cartridges that works fine as a replacement cartridge in the HP printers. We would not recommend to use these cartridges as a replacement with cartridges from other manufacturers. Q. Can you please tell me about the weight this HP CB436A (36A) cartridge carry? Is it more or less than 500g? A. The weight for the CB436A (36A) toner cartridge is about 1200 gram. So, it weighs more than 500g. Q. I am confused for the correct toner cartridge model to buy for my HP Laserjet P1505n printer. Could you please suggest? Q. Can this HP Laserjet 1505n toner cartridges for HP Laserjet 1505n printer be used in the HP 1300 printer?